The Guardian reports that the UK’s Attorney General used this argument to try to convince the EU to change the backstop. BRITISH ATTORNEY GENERAL Geoffrey Cox has reportedly claimed that the Irish backstop posed a threat to the human rights of citizens in Northern Ireland. He’s faced a bit of backlash for his remarks, reports The Guardian, including from a woman who is challenging the UK Home Office over its treatment of Northern Irish citizens. “Hearing Geoffrey Cox attempt to argue the backstop would breach human rights in Northern Ireland has me speechless,” Emma DeSouza said on Twitter. It’s been argued that the backstop breaches the Good Friday Agreement, as if checks were placed along the Irish Sea, it would mean changing the relationship between Northern Ireland and the UK. On that same basis, however, Brexit itself could be argued as a breach of the Good Friday Agreement, as the relationship between Northern Ireland and Ireland will probably change. In this case, it’s reported that Cox argued the backstop contravened Northern Irish citizens’ human rights, as it would leave them within the European Union but with no representation in the European Parliament. Earlier today in the House of Commons, Cox answered questions on the progress that had been made during negotiations with the EU. He was asked if it was still the plan to change the backstop, and add a codicil, or additional note, to the Irish backstop in the Withdrawal Agreement. Cox’s advice on the backstop in its current form caused quite a stir. MPs spent days in December calling for it to be published, which it eventually was, and made quite a splash when it landed. The Attorney General’s legal advice confirmed that the backstop would “endure indefinitely” and would mean that there will be more customs checks between Northern Ireland and Great Britain than there are currently. Cox says that there are parts of the deal that contradict each other, meaning that it’s not clear whether the backstop is temporary. It’s this advice that has led Brexiteer MPs to criticise the backstop, and call for changes such as placing a time-limit on it or allowing the UK to withdraw from it without needing the approval of the EU. Cox has been attending talks in Brussels this week in the hope of finding this codicil, that would mean he can change his legal advice without changing the essence of the Withdrawal Agreement. Mr Speaker, it’s come to be called ‘Cox’s codpiece’. What I am concerned to ensure is that what’s inside the codpiece is in full working order. Email “Geoffrey Cox argued that 'backstop could threaten Northern Irish human rights'”. 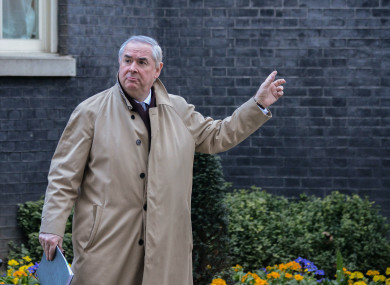 Feedback on “Geoffrey Cox argued that 'backstop could threaten Northern Irish human rights'”.